Celebrity Jersey Cards is a regular series in which I create virtual trading cards for celebrities wearing sports jerseys. Today, we continue our alphabetical journey through all Major League Baseball teams. 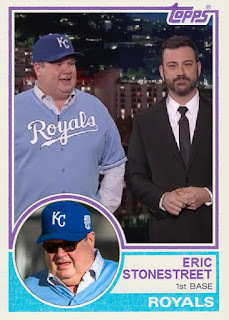 Eric Stonestreet might be best known for his role on tv's Modern Family. A native of Kansas City, KS, Stonestreet attended Kansas State University and is a huge fan of Kansas City sports teams. He even wore the powder blues when he made an appearance on Jimmy Kimmel's show to earn his Celebrity Jersey Card. Born in Connecticut, James Van Der Beek rose to fame as an actor, most notably on tv's Dawson's Creek. Van Der Beek participates in a lot of charitable events, including many baseball-related ones. He's not afraid of getting dirty while playing either, as seen on his Celebrity Jersey Card.